It will premeir in October 1. The Official website for the newest entry in the Digimon Franchise it has uploaded a new trailer...Although it is quite short. “Everyone in the world uses smartphone apps. 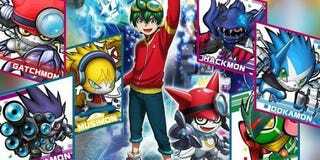 But inside them lurks unknown creatures called “Appli Monsters,” or “Appmon.” The Appmon are AI lifeforms with the ability to think and act, and exist in the boundary between the human world and digital space to allow people and the system to interface and function. But in the vast sea of the internet, the “last boss AI” Leviathan takes control of the Appmon with a virus and begins hacking every system, thus starting to control the human world from the world of the net.